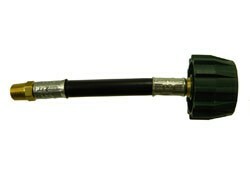 The Type1 pigtail is used to connect a propane cylinder to the pressure regulator with a 1/4" FNPT Inlet. The MB Sturgis Type1 provides a higher rate of flow resulting in a decreased potential for the system to go into bypass mode and therefore shutting down the gas supply. The Type1 includes an internal back check to ensure the system does not allow a back flow of gas. Available in 15" and 20" overall lengths.